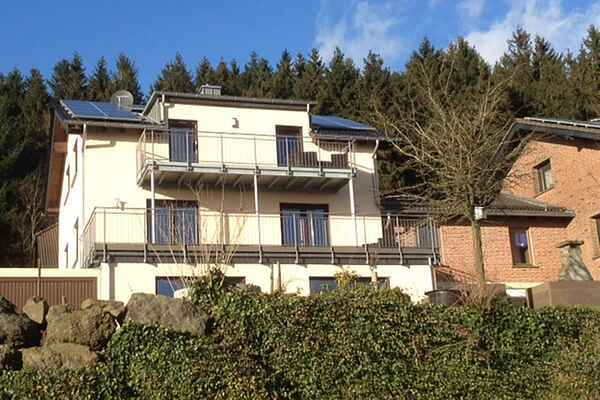 This modern apartment can be found on the outskirts of the small Eifel village Weinsheim, located between Prüm and Gerolstein. The apartment has been completely refurbished and features a large open living room with dining area, spacious kitchen and living room. You will have access to a modern bathroom with a bath and shower and a lovely bedroom with a large double bed. The whole apartment is easily accessible even if you have mobility challenges. Relax and enjoy the big patio, accessible from both the living room and the bedroom. From the patio, you have a panoramic view of the rolling Eifel landscape. A beautiful place after a day of enjoying the nature and tranquility in the Eifel with a glass of wine in hand and to watch the sun set. The house in which the apartment is located, is located on a dead-end street. There's free parking on the street in front of the door. From here you can walk straight into the woods for a beautiful hike. Shops, restaurants and entertainment can be found in Prüm, 10 minutes away by car. The town of Gerolstein is also worth a visit. For a day trip, we recommend a visit to Luxembourg, the Moselle or the Nürnburgring.